Short benched, playing injured ... Todd Dutiaume reveals how his players took their finals ambitions to the very wire. It was apparent that we were going to be up against it going into the weekend with some terrible injuries and suspensions, but they rose to the occasion again. They always do. I thought it was a fantastic game on Saturday night and the atmosphere in the building was wonderful. You could tell at the back end with only four main guys back there that fatigue started setting in. On Sunday we let that early goal go in on the powerplay, and it was 1-0 hockey game all the way through until we pulled the goaltender. It was difficult after that first period and a half to start generating offence. They sat back, and our legs were tired. We demanded they came back, but it was tough. Did Nottingham play the perfect game against your short-benched side? They haven’t really played that disciplined style all year. They were a very talented team and which loved to run and gun, but which had defensive flaws. But they played a smart game on Sunday, and good on them too for battling back on Saturday when the momentum was against them. We knew as a coaching staff that we wanted to go down there with a lead, regardless of what size – that would have given us that extra boost. But to leak that late goal on Saturday to tie up game was a bit of a drainer. Would Brett Bulmer have made a difference in what was effectively a one-goal series? Yeah - he was right up there as the joint leading scorer of our club. It was another key body down up front, and our forwards started getting tired towards the end. Add in Chase Schaber and Rick Pinkston and it’s almost as if the stars aligned negatively. Rick gets aninfection that keeps him out of the line-up and we lose arguably our steadiest D back there. Scott Aarssen tapes himelf up with a tear in his groin and plays 60 minutes over the two games. James Issacs played 60 minutes and he was laying on the floor in Nottingham with his whole body cramping up. He was in some significant pain. It shows that they left everything out there. They didn’t have an ounce left. There has been a positive response from fans despite the defeat? I don’t expect people to be happy with every decision, or every performance, but when they support their local club like they have over the last number of weeks, it’s such a positive working environment. Guys want to do more. They don’t have a bad taste in their mouth from negative comments being sent directly to them. Hockey players are like anybody else, they want people to like them and respect the job they’re doing. They got that recognition they deserve, and I also think our fan base got the performance they’ve sought after as well down the stretch. The search for a major trophy continues into another season. Is it an achieveable goal for the club in the EIHL? 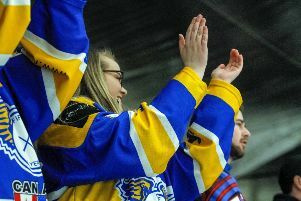 Guildford showed it this year by getting themselves to a Challenge Cup final and following that up by making it down to the play-off finals in Nottingham where anything can happen. We’re two teams similarly matched up, and we found ourselves more or less in the same position in the standings. It is possible for us to do these things. We got a small taste of it with the conference last year, and we ultimately want to be back there. There’s a lot of excuses I can make, and ultimately we’re fighting teams that have weekly budgets over twice the size of ours. We have teams that fly up for weekends here and stay for three games and you meet them rested. It sounds like small things but add that up over a 70-game season in 32 weeks, it’s a lot of games, and that’s one of the reasons we ran into so many injuries. By the end of the season we had an extra import and I still wasn’t able to dress a full line-up, and it has to stop somewhere. We’re going to continue to put quality, competitive teams together, but we’re getting to the point where teams have two or three extra imports stitting in the stands waiting to go in. It’s just not viable for us. We need a season where we stay healthy, and another summer of great recruiting, although ultimately, we’re all competing out of the same pools, so it’s competitive out there. What stage are you at with regards planning for next season? We’re in the process of having our exit meetings. There will be some players I imagine will be back, some will want to explore other options, and for some it’s going to be their last season playing. We need to have a sense of what everybody is doing, but we’d like to get a number of players wrapped up early-ish, just so we know what we’re working with as a core, and work our way out from there.